This range of nitrile work gloves from Pattersons Workwear offer good chemical and abrasion resistance. The nitrile formula on these work gloves offers resistance to oil based chemicals and they have a superior raised diamond grip pattern. 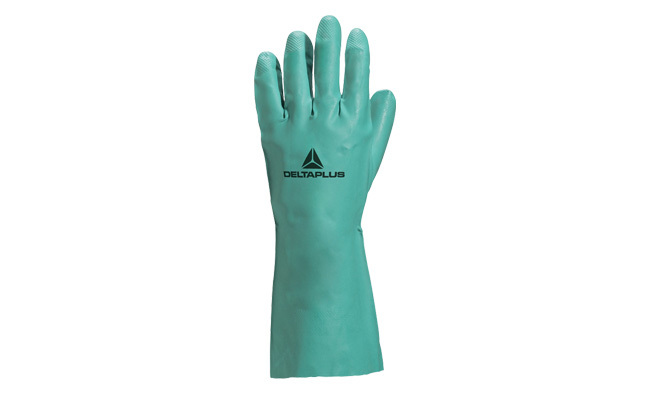 These nitrile gloves are flock lined for extra comfort during usage, while the open cuff allows ventilation to keep hands cool. Work gloves from this range are manufactured and inspected in accordance with the European PPE Directive 89/686/EEC and tested to European Standards EN420, EN388 and EN374. Browse our large range of work safety gloves to find the right work gloves for your needs. While you’re searching for the correct fitting glove, browse our large range of clothing to match your nitrile work gloves and also see our large PPE section to ensure you have all the safety workwear you could need. If you have any questions, or need any guidance about which safety nitrile gloves just give us a bell!